to use it on your standard word processing ..."
Clip the receiver at the top of the page, turn it on, and then start writing. 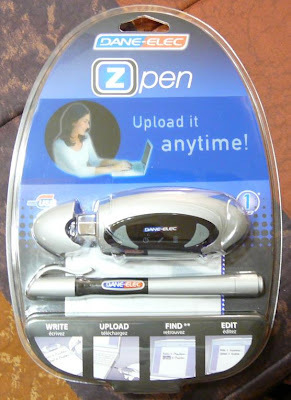 The pen beams the writing to the receiver which stores it on the included flash memory. 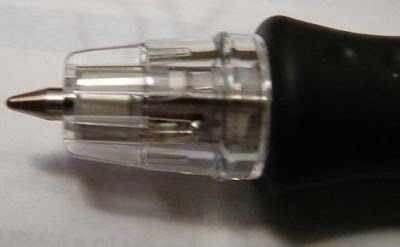 When done, pop off the cap and plug the receiver's connector into a USB port on your computer. The Pen and Ink software is installed on the flash memory and launches to reads the .ELI files. The software allows you to save them as PDF files. The included flash memory also has an OCR software package, MyScript Notes, that can be installed on your PC. It allows you to convert the writing to text or a Word document. How good is it? See below for some samples - the first image is an actual written note, the second is the .ELI file received/saved by the Pen and Ink software, and the third is the OCR'd text. It must be noted that the OCR output below is without doing any "training" of the software, (which should greatly improve the conversion) and is rather good considering the poor penmanship! 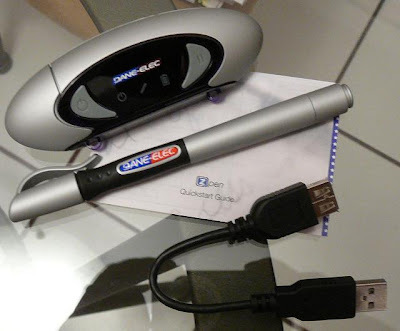 Check out the link below for an extremely thorough review that goes into much greater detail re the features of this gadget.